Well, it’s that time of year again. Trick ot treaters at your door. Here’s a few things to consider if you are elderly or live alone. Do not open your door for trick or treaters who are bigger than you and have masks on. Due to the day and age we live in and the insane things we see on the news, this is an inherent danger. You can leave a plastic pumpkin in your walkway filled with candy for the little ones. Hopefully, a teenager will not come and dump the whole thing in their bag,. This happened to me one year. Hence now lights are off, blinds closed. Usually, I don’t get any knocks on the door anymore, so it’s effective. One year, when my children were much younger, we’d go all over the neighborhood. All candy had to be inspected before eating. One year my six year old opened a mini mounds bar to find straight pins inside. Alarming? Yes it was! From that year forward, my friends and I would take turns having Halloween party at home. All children came in costume, played games n won prizes. Dunked for apples, musical chairs, pin the leaves on the pumpkin or eye on a skeleton etc. All got goodie bag on the way home and had lots of fun. Most importantly, they were safe. While its a little late posting this blog, it is something you may want to plan next year. Turn your house into a haunted house, rotate at different friends homes each year. 1. Slice small area off of worst side of lemon to make a flat base so mouse can stand and not roll. Do not discard cut piece. 2. Locate the pointy part of the lemon. This end end will be the mouse’s face. 3.From piece you cut off lemon, scrape lemon off the peel and cut two round shapes. You may use kitchen shears if you wish. Then poke two slits with knife on top of front end and insert circles. This will be the mouse’s ears. 4. With a toothpick or skewer poke two holes where eyes will be and then push clove or peppercorns in holes to create the mouse’s eyes. 5. Poke three holes with toothpick or skewer on sides of nose and carefully insert chives for whiskers. 6. 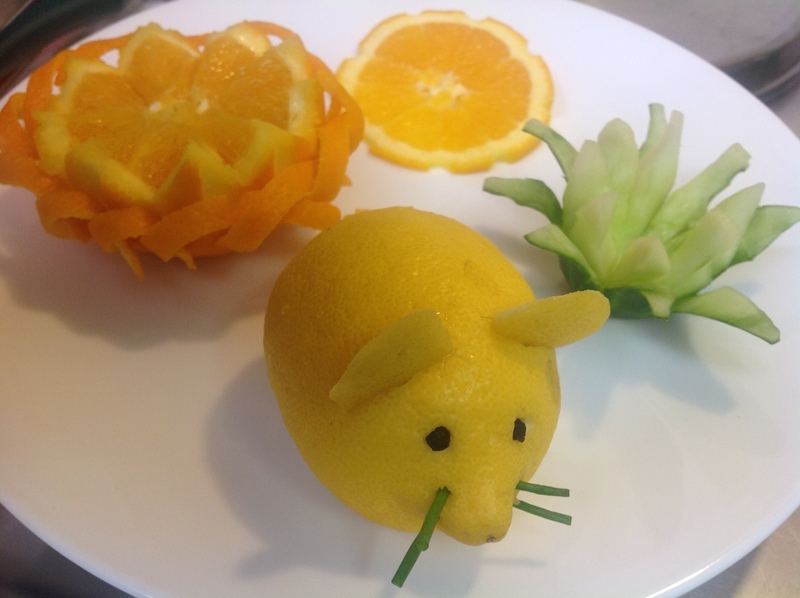 If you wish a tail, use potato peeler or paring knife and slice lemon peel and attach with toothpick to hind end of mouse. 7. With a toothpick, poke two or three small holes where the whiskers will be. With scissors, cut chives to size.